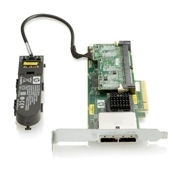 The HP Smart Array P411 is HP 's external connect only PCI Express (PCIe) 2.0 Serial Attached SCSI (SAS) Raid controller. The low profile half height card has 8 ports and utilizes DDR2-800 memory. The P411 is ideal for RAID 0 1 1+0 5 5+0 and can be upgraded with a minimum of 256MB cache module battery kit and smart array advanced pack license key for Raid 6 (ADG) and 6+0.